You know that feeling when you're just drawn to something, when you feel like you cannot continue existing without this object? Yeah. 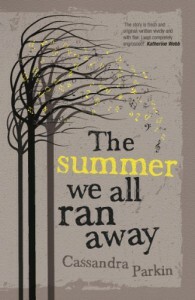 That was me when I saw the cover of The Summer We All Ran Away. I'm shallow, and I judge books by their covers. And this one.. oh my. I went all grabby-hands on it. The point is, however, that unlike most other times when this has happened to me, the content wrapped in this cover turned out to match it in quality. We've got a talented author on our hands here. We really do. The story itself is simple enough, but it gets slightly complex, and eventually it will require quite a lot of focus (or, you know, actual note-taking) to keep up; it jumps between past and present, and various characters and their stories are intricately woven into each other. Each character is well-developed and somehow, they're entirely over the top in the best sense of the word. Especially Priss, who is annoying and sweet and all-round teenager-y at all times, and yet it is difficult not to adore her. We are, naturally, given the nature of the story, told about the backgrounds of the characters, and this is where we find the only downside I can point out: Parts of that of Priss is told in some MSN-chat-slang. Had I been older, I would have despaired and given up on it. It is too bad, really, because a lot of important details that are almost required to understand in order to make sense of the parts written in regular English are hidden in these MSN-conversations, and it is really too bad if you miss out on anything because of this. Overall, The Summer We All Ran Away is delightful, intriguing, fascinating and absolutely wonderful, and I cannot express how much I encourage everybody to read it. If not for anything else, then for the wonderful characters.